Tattoos have many purposes including acting as a distraction from the state of one’s hair. The idea emerged after our January trip to Thailand. Walking past a series of tattoo parlours, one of my kids joked that we should get tattoos. ‘Oh but your dad hates tattoos,’ I said. ‘Well, I dunno, maybe a little one might be nice,’ the tattoo loather said. Huh? So the seed was sown. A couple of weeks later, a friend put ‘I’m getting a tattoo’ on her Facebook status. ‘I’m thinking of getting one too!’ I responded, amazed at the coincidence. It turned out that she had no intention whatsoever of getting a tattoo but was participating in some Facebook meme. Too late! I’d outed my vague idea and proceeded to discuss it online as if it were a concrete idea. Designs were discussed. Tattooists were recommended. Hitherto unknown (to me) tattoos were revealed. It was hard not to get carried away on other people’s enthusiasm for permanently dying a portion of my skin. Every Thursday, I run with my friend KC. She has three tattoos, though I didn’t know this until I expressed my own vague idea, now concrete idea, now ‘let’s make an appointment’ idea. She offered to go with me to look at designs. I knew where I wanted it – on my shoulder so that it would be visible in my running tops – but I wasn’t so sure of the design. By the way, I’m certain that if I hadn’t taken up running, I’d never have considered getting a tattoo. I’m not altogether sure why that is. After a bit of thought, I planned on getting a Chinese symbol related to running which is why, of course, I ended up with a Celtic Butterfly. The Chinese symbol was to signify my time in Malaysia as well as my newfound passion for running but then I realised that there are probably people in Europe, who’ve never been to Asia, sporting Chinese tattoos so I reverted to my Celtic roots. Not being religious at all, I wasn’t into a Celtic cross and a shamrock was well TOO Celtic so I found a butterfly online and liked the look of it. KC loved it, the tattoo artist, Lina, thought it would work, so an appointment was made, a deposit was paid, and I didn’t tell my husband as he was in Australia and it slipped my mind. Unsurprisingly, Tattoo Artist Lina loves tattoos. She plans to eventually cover her arms in ink. This is the most amazing thing about this whole tattoo experience. I am a control freak, with chronic anxiety, who does nothing lightly, worries constantly, and is rarely spontaneous. Yet, the prospect of getting the tattoo didn’t bother me at all. There were no nervous trips to the loo as I waited with KC in the waiting room, no fidgeting, no agitation. I was as calm as I am capable of being, sober. I was bothered much about the pain, as I knew it would be fleeting. I’m sure some of this uncharacteristic zen-like feeling was due to the fact that KC was with me and that Lina is really a lot of fun and I trusted her completely (don’t ask why, I just did). For once I surrendered control and it was a very pleasant experience indeed. Tattoo complete but the skin is still inflamed. KC held my sweaty hand throughout the process and the three of us chatted about everything from childbirth to jobs and of course tattoos. I asked Lina if people had ever left in the middle of a tattoo as they couldn’t’ bear the pain. Plenty have apparently. After thirteen years, Lina still remembers the first tattoo she inked, and does three or four clients a day. The inking process was mildly uncomfortable at times but nothing compared to the pain of Shock Wave Therapy on my foot. There was a scratching sensation but little more. Afterwards, I felt like I had a little bit of sunburn on my shoulder. But I didn’t. I had a Celtic Butterfly which I’ve decided symbolises my provenance, combined with metamorphosis and change. We’re all changing all the time, nothing remains the same, but I’m also living a life that requires massive change and upheaval every few years, so the butterfly symbolises that reinvention. Clever eh? Yes, phew, as I only came up with that after the permanent mark had been inked on my skin. I chose the butterfly because I liked the look of it and was too lazy to do much more research! So it’s there for good, a souvenir of Malaysia, a badge to display when I run, and a reminder of a rare episode of calm. Luckily my husband, who I did tell before the appointment, pronounced the tattoo ‘very nice’ and ‘elegant’. KC says I’ll definitely want another one. I can’t contradict her. But for goodness sake don’t tell anyone I said that as sometimes, a few loose words about vague ideas can develop into full-blown actions, and I wouldn’t want to make a habit of such rash behaviour! It’s a beauty. I got one 10 years ago and am in the market for another. I love them. 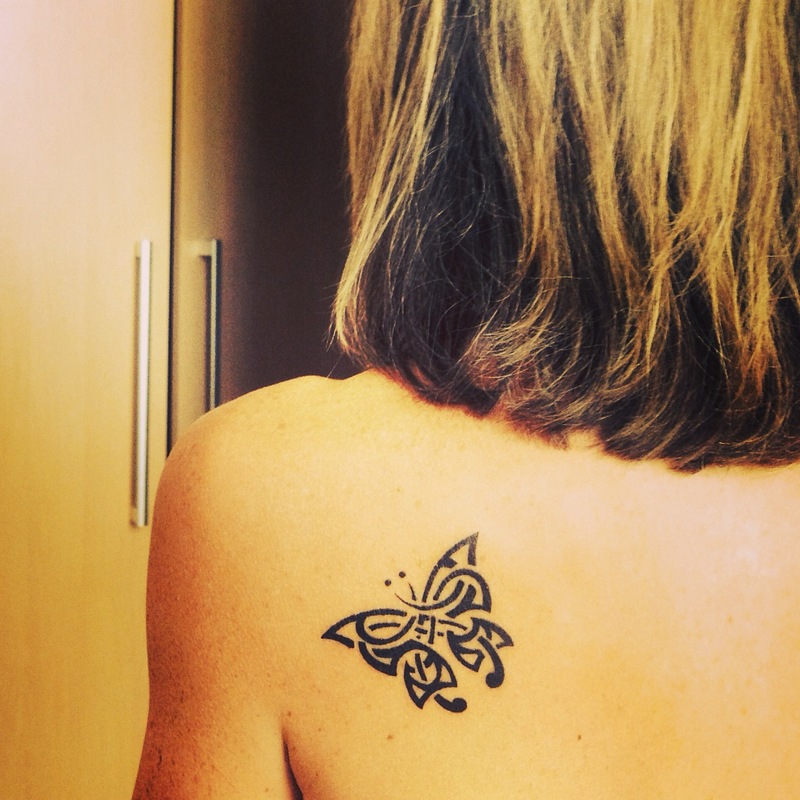 Nuala, I think you’re latest book deal is definitely worth celebrating with a tattoo! I always said if I was published by Penguin, I’d get a penguin…. Before that, though, I have an Emily D one in the pipeline! It looks great!! Good choice! I also want to get a tattoo that will symbolise the running side of my life. I have two tattoos already, I have made sure not to go crazy and get something I will regret. 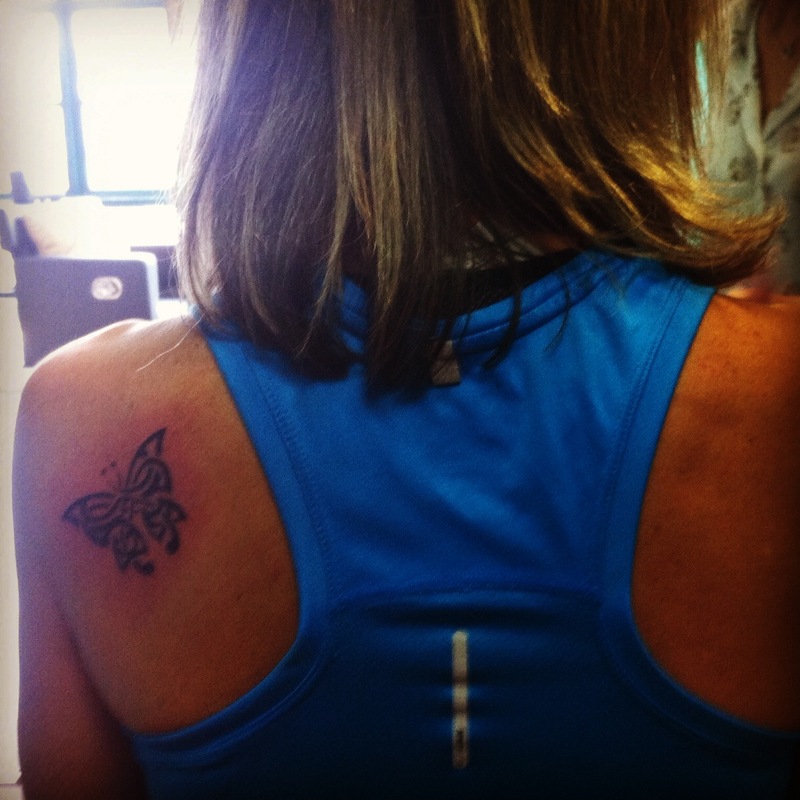 I have large butterfly wings on my back, going right out to my shoulder blades. It was my first one and it really hurt. I have a feeling that the tattooist was using the wrong size needle and was working too fast and so it really felt as if her were cutting not stabbing into my skin! He did a bit of a rough job in some places, so I would like to get it re-done and modified at some stage. The other tattoo I have is on my collar and is a ‘divorce’ tattoo lol from my first marriage. They do become addictive, but here in NZ they can be very pricey if you want someone decent to ink you. Thank you 🙂 I’m glad I didn’t know about how painful your tattoo was before I had mine – it would have put me off! I’m discovering actually that many people have them but keep them hidden. You’re the first I’ve come across with a divorce tattoo but I can see that it’s an idea that could be popular! I’m sure it’s cheaper here than in NZ – this cost me 30 NZD. its beautiful. and i love the tribal effect. butterflies have great meanings! Perth CBD from Lake Monger. © Johanna C. Leahy and Irish Nomad on the Run, . Unauthorized use and/or duplication of this material without express and written permission from this site’s author and/or owner is strictly prohibited. Excerpts and links may be used, provided that full and clear credit is given to Johanna C. Leahy and Irish Nomad on the Run with appropriate and specific direction to the original content.